There are several ways to start PipesAndPlanks, a tool in the Depiction category. It is also implemented as the command pipes. The model of interest should be chosen from the pulldown list of open molecule models (indicated by the black inverted triangle near the top of the dialog). Helix color, Strand color, and Coil color assignments (default No Color) can be changed by clicking the respective color well and using the Color Editor. A No Color setting indicates that each pipe, plank, or stretch of coil should be colored using the residue color (ribbon color) of its first residue. 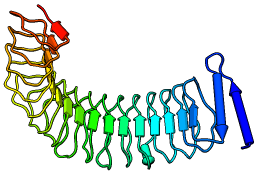 If a protein chain had been rainbow-colored from N-terminus to C-terminus, for example, each secondary structure element would be shown with a different color in the rainbow range. Helix edge color, Strand edge color, and Coil edge color are set to No Color by default; if set to a color, outlines in that color will be drawn for the corresponding part. These outlines may be useful in addition to standard silhouettes. Helix radius, Strand width, Strand thickness, Coil width, and Coil thickness default to fixed values of 1.25, 2.5, 1.0, 0.25, and 0.25 Å, respectively. If Fixed [helix radius, strand width, or strand thickness] is instead set to false, the specified value is ignored and the parameter instead depends on the distances from the constituent α-carbons to the axis of the helix or strand. If the ratio of maximum to minimum distance from α-carbons to the axis exceeds the [Helix or Strand] split threshold (and the corresponding Split curved... option is true), the pipe or plank will be split into two or more parts. Show arrow on helix and Show arrow on strand (both default true) place arrowheads on the C-terminal ends of secondary structure elements to indicate N→C directionality. Depiction of coils can be turned off by setting Display coil to false. Coil subdivisions (default 10) refers to the number of segments per residue used to represent coils. Clicking OK creates the display and dismisses the dialog; clicking Apply creates the display without dismissing the dialog. Close dismisses the dialog, and Help opens this manual page in a browser window. The pipes-and-planks VRML model is assigned the same model number as the corresponding molecule. The original model will still be shown; one may wish to undisplay its ribbons or to hide it entirely using the Model Panel. The VRML model can also be hidden, shown, or closed with the Model Panel.